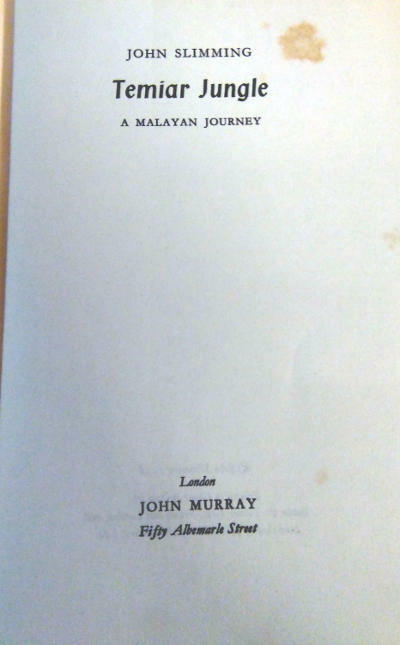 Publisher: John Murray, 1958. First edition. Condition: Hardcover, with dust jacket. Very good. Slight wear to dust jacket, slight foxing to book. With 16 black-and-white plates. 176pp., app 9″ by 6″. 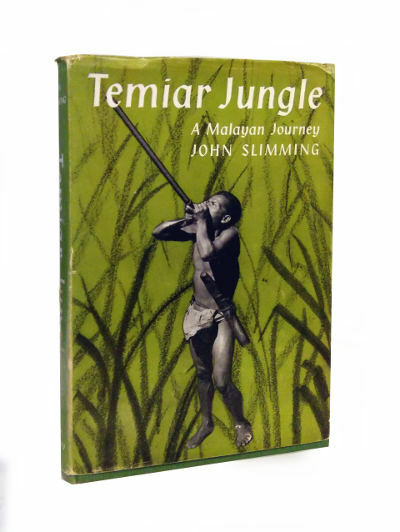 John Slimming, who was Assistant Protector of Aborigines, made the journey which this unusual and original book describes in order to make a survey of the Temiar communities in the Malayan jungle and of the acreage of land they had under cultivation. The aboriginal Temiar-Senoi are a primitive people living in the jungle of Kelantan. They are fair-skinned, wavy-haired, semi-nomadic, practising a shifting cultivation within certain hereditary areas, living on their land and hunting and trapping animals and wild game. The Temiar are now becoming affected by the impact of civilization and the purpose of the survey was to obtain the information necessary to help safeguard their welfare during this period. They are naturally being disturbed by the sporadic guerrilla warfare going on in the jungle around them and by the problem of maintaining their cycle of cultivation. 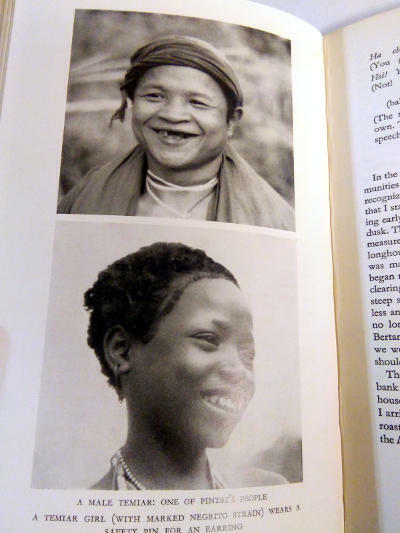 The author took with him as Field Assistan a Sikh born in Penang who had jungle experience, two porters, and two guides. He made his journey by raft, by boat and on foot. He stayed in the Temiar longhouses, and his journal, written while living in these communities, is a fascinating part of the book. He moved from one group to another, living with the Temiar and sharing their food; he gained their confidence and established a very real understanding with them, for he speaks Malay and some Temiar. John Slimming was born in London in 1926 and educated at King’s School, Canterbury. He joined the Army in 1944 and was trained as a glider pilot; he served with the Sixth Airborne Division in Egypt and Palestine before he was demobilised in 1948. He spent the next three years acting in Repertory before entering the Malayan Police Service in 1951. He was seriously wounded in a gunfight with Communist guerrillas in the following year, which necessitated prolonged treatment in hospital. Later he studied Chinese at the Government Officers’ Language School until, in 1954, he was found medically unfit for further service in the Colonial Police. His subsequent appointment as Assistant Protector of Aborigines took him back to Malaya again, first to Perak and then to Kelantan. 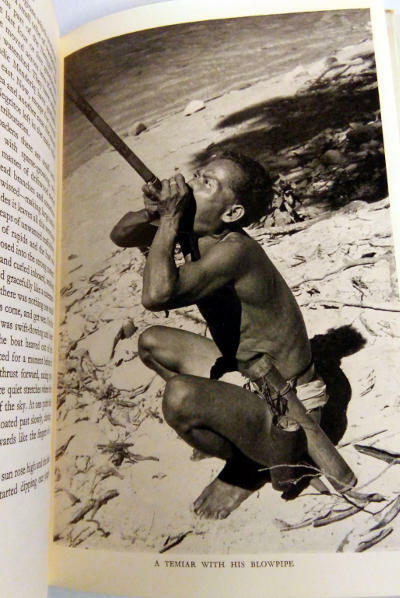 In 1957 he was found to be medically unfit for arduous field work. His wife is Chinese. He is at present working on a novel for publication in 1959.